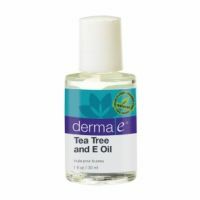 Tea tree oil 75% (Melaleuca Alternifolia) and Vitamin E 25% (Tocopheryl Acetate). Heals acne Prevents new acne Smooths skin tone Moisturizing Does not dry or irritate skin Is not greasy for oily skin 100% natural Cheap Stinks, but worth it This product is amazing. I have oily acne prone skin, and I was VERY skeptical about using an oil. After using benzyol peroxide that totally left my skin dry, red, inflamed, blotchy, and uncomfortable I stopped it. I decided to try tea tree oil because it was natural. I found this one at Walmart for about 11 bucks Canadian, I thought it was good that it included 25% pure vitamin e (and 75% pure tea tree oil) because I read plain tea tree oil can dry the skin out. I did a spot test on the arm of the pure product and got no reaction, so I applied a layer all over my face with a cotton pad. Used sparingly, it does not look overly oily, and the it soaks in completley i about 30 mins so no residue on pillow. The smell goes away too in the same time. I braced myself in the morning, but my skin looked AMAZING! Combined with vitamin e (25%) the product is actually very moisturizing on my oily skin, in just the right amount. All blemished were reduced, and my skin tone was evened out (which I was not expecting!- I suffer melasma). I am still using this after 4 days with no breakout just better skin every morning and a beautiful glow. I wish I tried it sooner!